Dang it, I get distracted by some sweet sweet mortality results, and two big announcements come through. Let me do the second first. Anthony M. Kennedy, one of the Supreme Court’s most consequential modern-day justices and author of landmark rulings on gay rights, the death penalty and campaign finance, announced his retirement Wednesday, handing President Donald Trump a historic opportunity to reshape the court. 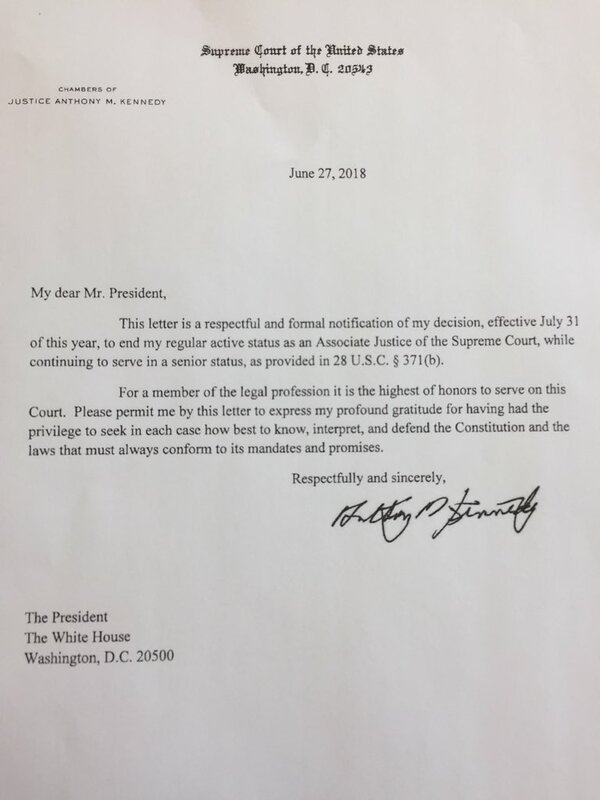 “This letter is a respectful and formal notification of my decision, effective July 31 of this year, to end my regular and active status as an Associate Justice of the Supreme Court,” Justice Kennedy wrote in a letter to the president. Anyway, various legal watchers are gonna be do all their analyses, especially once they hear of Trump’s nominee. But that’s not my interest. I’m gonna have to update my SCOTUS mortality calculations. Here was my part 2 of the mortality calculations. In the meantime, this is is the list of possible Trump nominees… from his November 2017 list. I fully expect him to pick one off that list. Althouse: I happened on the Kennedy retirement story as I was flipping channels on the car radio. Will be a nice, quiet summer, right? I think the biggest impact from an adverse ruling in the SCOTUS case would be on specific individuals — to wit, the union leaders who get a better-funded pension via their union and get paid nicely for “union organizing”. If they have to convince people to stay members of the union, they may actually earn their money for “organizing”. When public employees were forced to pay fees, whether they want to be a union member or not, it makes one’s “organizing” job a hell of a lot easier, I would think. Then there’s the various hangers-on of political campaigns. If public union campaign cash is drained away, there are a lot fewer ineffective campaign consultants who can be hired. WON’T ANYBODY THINK OF THE POOR CAMPAIGN CONSULTANTS?! I don’t think that an adverse ruling by SCOTUS would actually kill public employee unions, and it definitely won’t kill the political power of public employees. The hysteria more represents the very vested interests of specific individuals who profit from forced-fees-paying to have a job. They would definitely be affected – either they lose money, or they have to work a lot harder to keep the same money. Man, it’s tough being in a competitive biz. So yes, the people who are paid to be in front of cameras and sending out press releases will be hysterical. Their jobs are on the line. But the public employees will still have power, even if they don’t have a union. From one who has been forced to pay fees to a union I wasn’t a member of when I taught at UConn (and who really wasn’t interested in the items they negotiated for), I would love Janus to come down where state employees are not required to be union members and are not required to pay fees if they’re not union members. But I am under no illusion that this will kill the political power of government employees. They still have interests, and they still have the power to vote. It would take something like not allowing government employees or political officals to vote to remove some of that power… but those people also have friends and family who would vote their interests, too. I can think of less radical “fixes”, but I think they would be more destructive than helpful. It’s like trying to fix human nature. Just know that once people see political positions or government jobs as something they own, they will exercise their powers to keep these, and do not require any official unions for this. I still think that, lo, these four months later. In many union-dominated states, legislatures have passed laws to make it really difficult for people to opt out paying those dues (expect that to go to SCOTUS next), when their energy would be better spent convincing public employees of the value of being a union member. It would be a good idea to at least start trying to convince people. Again, I think it doesn’t even require unions for public employees to elect the people who give them the most goodies. But it does cut down on the organized negotiations. It’s nice to see that public pensions did make part of the ruling, though. Justice Kennedy retiring? I have to be away from the Internet for a few, but can't wait to come back to giggle at all the outrage! You cannot kinda sorta partway destroy a norm. Once Reid ended the filibuster for judicial appointments, it was clearly not going to hold back any Supreme Court nominee liberals hated. The Right should stay classy and thank Kennedy for his service. Well, so much for any GOP midterm turnout worries. Democrats after a socialist wins nomination for a house seat. Oh, this summer…. will be “fun”.